One of the main reasons we launched K12 Accountability is because as parents we fear for the future of our children and their peers. When they graduate from high school, our children will face a global economy in which they will have to compete not only against other students from all around the world, but also against the rapidly improving power of technologies that can increasingly perform sophisticated activities that once required human labor. Put differently, the bar for real college and career readiness is rapidly rising, even though our children still have just 13 years to meet it. If we don’t focus on improving student achievement growth, our kids will struggle all their lives. “In the past, education was about imparting knowledge. Today, it is about providing students with the tools to navigate an increasingly uncertain, volatile world. Unfortunately, the skills that are easiest to teach and test are also the easiest to automate or outsource. State‐of‐the‐art knowledge remains important. But the global economy no longer rewards workers for what they know (Google knows everything); it rewards them for what they can do with what they know. Unfortunately, results from a wide range of international studies, from the OECD’s Program for International Student Assessment (PISA) to its Program for the International Assessment of Adult Competencies (PIAAC) consistently find that too many young people in the United States lack the knowledge and skills they will need to thrive in the future. And sadly that’s also true here in Colorado. The achievement problems in Colorado’s public schools aren’t all due to poverty, as some people claim. Every student in Colorado takes the ACT in eleventh grade. It is the last comprehensive measure we have of the cumulative result of the taxpayers’ investment in twelve years (K-11) of their education. Consider the 2015 results for students not eligible for free and reduced lunch (which is the indicator schools use for poverty) who live in six relatively affluent suburban Front Range districts: St. Vrain, Boulder, Jeffco, Cherry Creek, Littleton, and Dougco. Only 52% of these students met the ACT’s “college and career ready” standard in reading, only 54% in math, and only 50% in science. Only about 25% of these students met the college and career ready benchmarks on all three tests. And the results for free and reduced lunch eligible students are much worse. Across the country, as this and this article highlight, very few of our children are actually on track to graduate college and career ready. But far too few parents realize this. Nationally, this failure to adequately prepare K-12 students for the challenges that await them after graduation has led to more than one third of them having to take expensive, non-credit remedial classes in college (including a shocking percentage of students from affluent families who attend private four year universities). Our K-12 student achievement problems are not, in most cases, due to a shortage of funding. There are a lot of things our public schools can do to improve achievement just with the funding they already receive. And analyses like this one clearly show that many school districts are not efficiently spending their current budgets. In sum, our public schools have to do a much better job of preparing our children for the challenging world that lies ahead. And as parents, we can’t stand by and wait until they do — our children’s education is happening right now. First, we need to understand the Colorado academic standards our children are expected to meet, including Math, Science, "Reading, Writing, and Communicating", and Social Studies. These documents are quite long, as they cover K-12 standards in these subjects. Shorter guides, and grade level guides that cover all subjects, can be found on the Colorado Department of Education’s website. Second, we need to understand how our children are doing in school, and whether they are meeting state standards and are on track to graduate high school career and college ready. Grades are certainly an indication, but they suffer from two critical flaws - the inflation of grades over time, and the inconsistent grading standards used by different teachers. As parents, we need to go beyond grades; that is why both parent-teacher conferences and standardized tests (assessments) are also needed for us to clearly understand our children’s strengths and areas for improvement. Every 11th grade student in Colorado must take the national ACT test to assess their "college and career readiness” (though that will be changing to the SAT). ACT and SAT scores are also used by many colleges as part of their admissions process. The ACT organization has produced some excellent research on college and career readiness. Here is their short overview of the readiness benchmarks, and here is longer paper on why they are important. Detailed definitions of the readiness benchmarks are available for reading, english composition, math, and science. In 2017, the ACT will be replaced by the SAT. Here is the most recent version of the “concordance tables” for converting ACT to SAT scores. It is critical that parents understand whether their children are on track to graduate college and career ready, because research has shown that once you fall behind, catching up is much harder that most people believe. 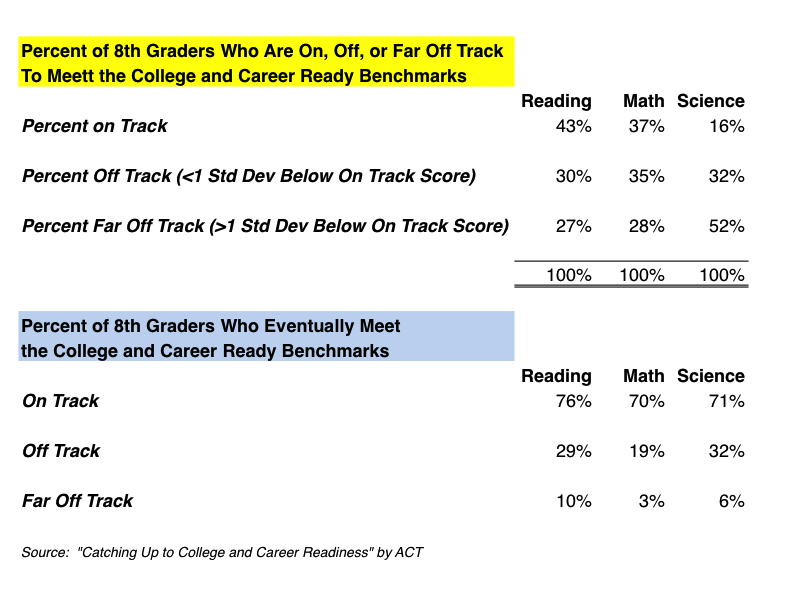 The table below summarizes the results of research undertaken by the ACT Organization, on the percentage of eighth graders who are far and very far behind who eventually catch up and meet the college and career ready benchmarks by the end of 12th grade. As you can see, the key takeaway from this research is that staying on track is critical, because catching up is very, very difficult. Would you like to better understand what your child's MAP scores imply for their future ACT results? This one pager shows MAP scores from grades 5 to 9 for a student who is on track to score a 24 on the ACT Reading and Math tests (click here for a website that shows you the average and 25/75 percentile ACT and SAT scores at different colleges). NWEA (the company that produces the MAP assessment) has recently launched a new website that makes it easy for parents to see, from as early as 5th grade, whether their student is on track to graduate career and college ready. And if your school hasn’t told you what your child’s MAP (RIT) results are, by all means ask for them! (Here is a longer research analysis on using MAP results to measure progress towards meeting college and career ready benchmarks). Third, as parents, we must make sure our children quickly get the extra help they need when they fall behind. Sometimes we can do that on our own. For example, at this site you can enter your child’s MAP (RIT) score and be taken to additional resources that you (and their teachers) can use to address any areas where they need extra help. Khan Academy is also has many very helpful resources. Finally, while Colorado does not have a model state curriculum that is aligned with state standards and PARCC assessments, other states do, and both New York’s and Louisiana’s can help you get a better idea of the material your student should be covering in different grades. But other times it requires us to band together and collectively advocate for more district and school responsiveness to our children’s needs. For example, here and here you can read two recent research papers about the surprisingly large and long-term negative impact of disruptive students in your child’s classroom. Send them to your principal (or superintendent or school board) the next time they downplay the severity of this issue. And never think you are all alone in taking on your district; you are not. There is no shortage of organizations advocating for children with a wide variety of needs who will support you. In forming K12 Accountability, one of our goals is to arm every K12 parent and advocate with better evidence and analysis, to help them to be more successful in their efforts to make public schools work better for our children. According to the Colorado Talent Pipeline Report, of every 100 students who start ninth grade, only 34 will eventually enroll in college, and about a third of them will have to pay for non-credit remedial courses, because they aren’t prepared for college level work. Only 23 students will eventually graduate. A new report finds that “86% of Colorado parents surveyed believe their child is on track to meet the goals and expectations for learning at his or her grade level…Yet in 2014-15, only 41% of 8th graders met or exceeded expectations in English Language Arts, and only 19% of 8th graders not taking advanced math class met or exceeded grade level expectations.” And the advanced math students? Only 30% of those taking Algebra 1 met or exceeded expectations, which was better than the 25% of geometry students who met or exceeded expectations. Achieve, Inc. has released three reports on its survey of students, employers, professors, and parents about the extent to which high school students are graduating well prepared for college and careers. The results are sobering. Here are Report 1 Report 2 and Report 3. Colorado’s high school graduation rates likely overstate how well-prepared our students are for the challenges that lie ahead of them. Learn more.